Denis Mujibi of PICO Eastern Africa (photo credit: ILRI/Mercy Becon). Denis Mujibi, working on innovation platforms with PICO Eastern Africa, introduces himself and his work with the program. It is one of a series of portraits of key people in Africa Chicken Genetic Gains (ACGG). I am a geneticist with training in statistical genomics. My initial training was in biochemistry, then I transitioned into biotechnology before finally ending up in animal science. My role in ACGG is to work with country teams to ensure that we have in place a transformative private sector-driven innovation platforms. This means ensuring that, with each subsequent meeting, the conversation is moving from problem statements and challenges to opportunities and options that the private sector can then use to maximize the efficiency of the value chain’s operations. But there are behind-the-scenes operational issues that have to be in place so that these conversations can happen. I ensure that the actors are aware of, and are delivering on their functions and allocated tasks. I also work with country teams to ensure that the right people are invited to the meetings. I intend to ensure that the successes we see at the national innovation platform are replicated at the community level. Consequently, I will be in constant touch with the country teams to see how well we can support each other for this to happen. I have extensive experience working with smallholder farmers in eastern Africa. One of my passions has been developing channels for enhanced uptake of best farming practices and appropriate technology transfer in developing-world contexts. The ACGG project is the quintessential research-in-development project. The prospect of seeing households transformed through uptake of technology really excites me. We should tread very carefully to ensure that we do not break the trust of farmers. If for one moment the focus shifts to more research and away from technology transfer, farmers will see this as another one of the research project meant to benefit the scientific community rather than them. It is time that our meetings became more dominated by the private sector and less by the research community. Only a private sector-led process will lead to the desired transformation in the poultry value chain, mostly because of the long-term sustainability implications. If we can demonstrate that matching options (sets of technologies, in this case chicken genotypes) to contexts (social and environmental landscapes) can lead to higher economic returns for smallholder farmers, then our (political) leaders will pay more attention to scientific evidence in decision-making. Let’s provide the evidence that we can find appropriate technologies and use appropriate mechanisms to lead to the uptake of improved chickens and that this process leads to increased incomes and more jobs. There is no other compelling way to demonstrate the need for evidence-based decision-making in the continent. The proof is in the pudding. Let’s make sure we don’t burn the pudding, because eventually we will eat it. 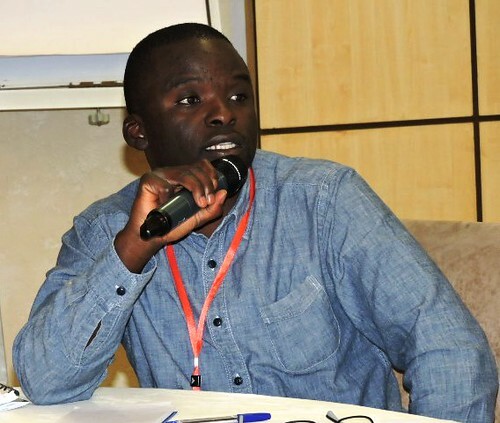 Tags: Denis Mujibi, innovation platforms, PICO Eastern Africa, voices. Bookmark the permalink.